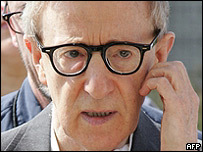 Woody Allen has said he makes films as a distraction from "depression and terror and anxiety" as he launched his latest movie in Cannes. His London-based comedy Match Point, stars Scarlett Johansson and gets its world premiere on Thursday. Johansson, 20, will attend the red-carpet screening. "I make films because if I don't make them then I don't have anything to distract me," he said. "My whole life I am constantly fighting all kinds of depression and terror and anxiety and I find that, like a mental patient in an institution, that if they keep the patient busy finger painting then they are more relaxed," he said. The film maker has made more than 30 films, including Annie Hall and Manhattan and famed for starring in many of them as an anxious, neurotic New Yorker. He said he found it "therapeutic" being kept busy by writing, acting, directing, editing and adding music, adding he did not "do it for the money". "If people come and see the movie in the end and like it I'm delighted it's a great thing, but I still have the benefit of living in an unreal world for a year. "After that I have to return to real life and that's always full of terrible problems so I create a new film and bury myself in it for that period of time." Shot in the UK capital last year, Match Point tells the story of a young tennis instructor who begins affairs with two women - romantic entanglements that ultimately lead to tragedy. Allen said he made the film in London to avoid the "rigmarole" of dealing with American backers, having found it "increasingly difficult to get financing in the United States". "It's become more and more prevalent for studios and financiers to participate in the project," he said. "They want to have a say in casting and read the script, and occasionally come to the set. I can never work like that. I don't let people read scripts." He added: "I want the money in a brown paper bag and to give them the film a few months later, and that's that." The film also stars Jonathan Rhys-Meyers, Emily Mortimer and James Nesbitt. It features such recognisable London landmarks as the Tate Modern, St Paul's Cathedral and Norman Foster's Swiss Re Tower, better known as the "Gherkin" for its unique shape. Allen has already announced plans for another film set in the UK's capital, in which he will also appear. BBC Films, which part-financed Match Point, will co-produce the new film as part of a raft of new projects that may include a Doctor Who feature. BBC Films boss David Thompson announced the company's involvement in Allen's next project alongside news of other upcoming productions. These include historical epic The Other Boleyn Girl, about Henry VIII's second wife Anne Boleyn and her sister Mary, a second feature from Bullet Boy director Saul Dibb, and Cult, a comedy starring Nighty Night's Julia Davis. Former Miramax bosses Harvey and Bob Weinstein are also in Cannes to screen 20 minutes of footage of their new film, The Brothers Grimm.